BINGHAM, Hiram, (father of Jonathan Brewster Bingham), a Senator from Connecticut; born in Honolulu, Hawaii, November 19, 1875; educated at Punahou School and Oahu College, Hawaii, 1882-1892, Phillips Academy, Andover, Mass., 1892-1894, Yale University 1894-1898, University of California at Berkeley 1899-1900, and Harvard University 1900-1905; professor of history and politics at Harvard and then Princeton Universities; South American explorer, credited with the discovery of the Incan ruins at Machu Picchu; delegate to the First Pan American Scientific Congress at Santiago, Chile, in 1908; captain, Connecticut National Guard 1916; became an aviator in the spring of 1917; organized the United States Schools of Military Aeronautics in May 1917; served in the Aviation Section, Signal Corps, and attained the rank of lieutenant colonel; commanded the flying school at Issoudun, France, from August to December 1918; lieutenant governor of Connecticut 1922-1924; elected Governor of Connecticut on November 4, 1924 but served only briefly; elected as a Republican to the United States Senate on December 16, 1924, to fill the vacancy caused by the death of Frank B. Brandegee in the term ending March 3, 1927; reelected in 1926 and served from January 8, 1925, to March 3, 1933; unsuccessful candidate for reelection in 1932; chairman, Committee on Printing (Seventieth Congress), Committee on Territories and Insular Possessions (Seventieth through Seventy-second Congresses); censured by the Senate in 1929 on charges of placing of a lobbyist on his payroll; appointed a member of the Presidents Aircraft Board by President Calvin Coolidge 1925; engaged in banking and literary work in Washington, D.C.; during the Second World War, lectured at naval training schools 1942-1943; chairman of the Civil Service Commissions Loyalty Review Board 1951-1953; died in Washington, D.C., June 6, 1956; interment in Arlington National Cemetery, Arlington, Va. Dictionary of American Biography; Miller, Frank L.Fathers and Sons: The Bingham Family and the American Mission. Philadelphia: Temple University Press, 1982; Bingham, Woodbridge. 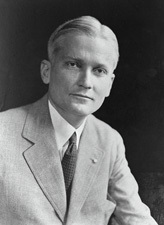 Hiram Bingham: A Personal History. Boulder: Bin Lan Zhen Publishers, 1989.